Dr. L. M. Darlong is one of the handful surgeons in India, dedicated to the care of non - cardiac thoracic chest diseases, and focuses on cancer surgery of the lungs, trachea, chest wall, oesophagus, and mediastinum. He emphasises on minimally invasive chest surgery using VATS and Robotic surgery. 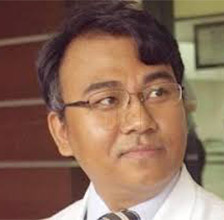 Dr. Darlong earned his Medical Degree from Gandhi Medical College, Bhopal and MS from AIIMS, New Delhi. He completed his Residency in Thoracic Surgery from AIIMS Delhi. He earned his Fellowship in Thoracic Surgery from Korea University Medical Centre, South Korea. Dr. Darlong pioneered advanced NUSS procedure for pectus deformity in India and is the first in the country to perform advanced NUSS procedure using technique of pectoscopy, crane lift and pectus tunneloscopy. First in the country to perform advanced NUSS using technique of pectoscopy, crane lift and pectus tunneloscopy for chest wall disorder. CTSNET [Cardiothoracic surgery network] Video top contents for Thoracic video 2013, " Single-incision-thoracoscopic-decortications- stage-3-organized-pleural-effusion". Son HS, Lee SH, Darlong LM, Jung JS, Sun K, Kim HJ, Lee K, Lee SH, Lee JT. Is there a role for a needle thoracoscopic pleural biopsy under local anesthesia for pleural effusions?. Korean J Thorac Cardiovasc Surg. 2014;47:124-128. 2006-2009-Assistant Professor Surgery, NEIGRIHMS, Sillong.